Wilshire 5000 (red line representing all publicly traded US equities), disposable personal income (dark blue line), real disposable personal income (light blue line), and federal funds rate (black dashed line). 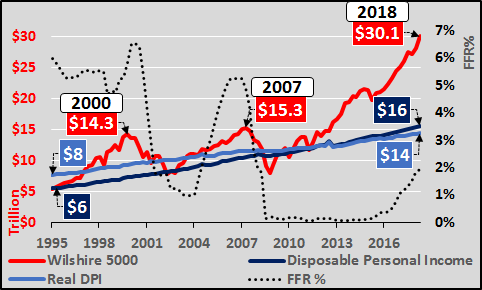 During each bubble, assets have appreciated far faster than incomes to support those higher asset prices. Lower interest rates and higher leverage have been used to incent greater quantities of debt...to be paid in the future. All data is through Q3 but not inclusive of the volatility seen thus far in Q4. And what role did lower interest rates play in rising asset valuations (and the encouragement of higher leverage)? Quite a bit. Chart below shows the household net worth as a percentage of disposable personal income versus the federal funds rate...and that is not a pretty picture. Assets valuations have never been higher in comparison to disposable income (what is left to all American's after taxes are paid). But the HHNW data only goes through Q2 2018...and I still expect to see one more bump in Q3...but after that, the die is cast, and asset valuations will likely be far lower, starting with Q4 and on. How could we have guessed it??? 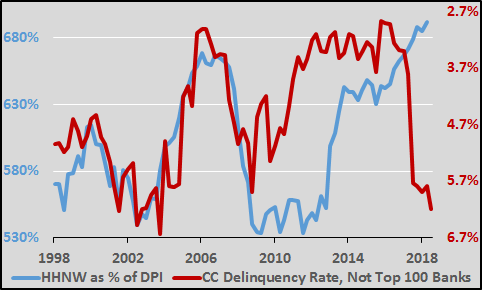 Credit card delinquencies among the not top 100 US banks versus household net worth as a % of disposable income (chart below). Essentially, on the way up, it's a party and many folks (including those most marginal) feel rich. But at some point the higher asset prices push rents too damn high, etc. etc. and the marginal consumer OD's on credit. Then the delinquencies begin. Consumers and banks both find themselves over their skis and in need of cutting back. A vicious cycle typically ensues. 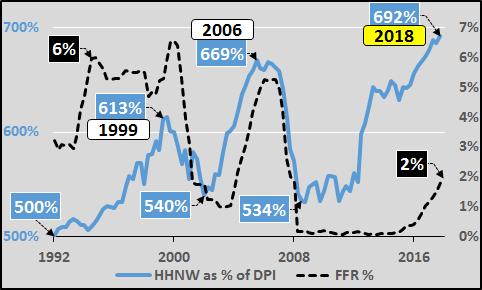 Finally, I've inverted the credit card delinquencies among the not top 100 banks versus HHNW as % of DPI (chart below). That seems telling. The other 4600+ US banks not getting interest on excess reserves, not too big to fail, have overextend to make a buck and keep up with the big banks. 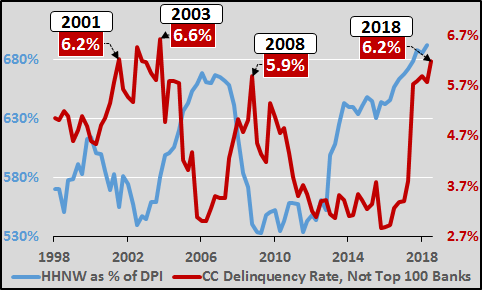 Now we find that the marginal US consumer is misusing subprime credit cards and the proverbial "canary in the coalmine" is dead. A typical pullback would see total household net worth decline about 25% until incomes are again more in-line and we have already seen a 10% pullback in US equities. But, my guess is this next retrace will not be typical and instead has great potential to be quite "atypically" severe. Perhaps the current market turmoil, the massive surge in federal spending coupled with slashed corporate taxation...maybe there's something behind all this more than the "trade war" narrative allows? It could be the massive surge in the "not in labor force" yet to come HEREor the minimal further growth in employment HERE or the next round of housing trouble now underway HERE. Or maybe it's a little bigger than that, something like the growth in global energy consumption collapsing, the details and causes discussed HERE.